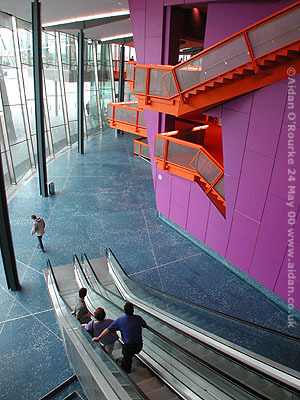 THE LOWRY centre, Salford Quays, is in my opinion a masterpiece of contemporary design. It benefits by being on a waterside location with no other buildings around it. The architects were able to give full rein to their imagination, and the result is quite unlike anything I've seen in Manchester before. Here are some pictures, taken today (Wednesday 24 May) and in previous weeks, showing this amazing building and its surroundings. THE LOWRY IN ITS FIRST MONTH is not yet fully open - Certain displays are still in preparation and the building is still being cleaned. It's already a tourist attraction, though, and one way to view it is to take this tour boat which runs from the city centre down to Salford Quays, and back. Here it is on its return journey, just passing under the new footbridge. The Lowry is a stunning and intriguing structure, made all the more impressive by its waterside location. But you need sunny weather and blue skies to show the metallic exterior at its best. GLOOMY WEATHER passed over Manchester on the weekend the Lowry opened (Sat/Sun 29/30 April 2000). Here a dramatic sky and the silhouette of HMS Bronington is reflected in the water of the Ship Canal. 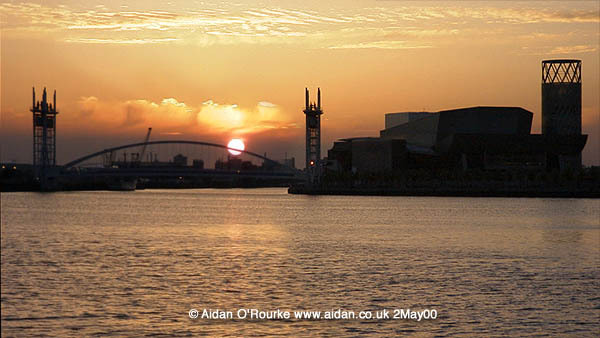 The Lowry is on the extreme right, and the site of the new Imperial War Musem North is on the Trafford Park side to the left. The juxtaposition of performing arts centre and war museum, linked by a footbridge across the Ship Canal is very unusual. The former Docklands will be opened up to be used and enjoyed by the public in a way that was never possible in their original role. 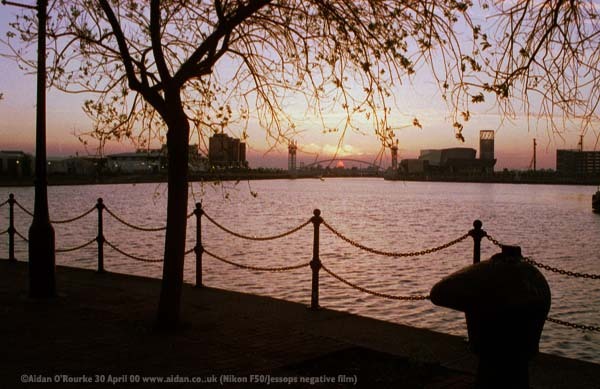 The Manchester Docks had a working life of only eight decades (1894 to the mid-seventies)- and it will have taken three more to transform them into the completed Salford Quays. WHERE CARGO WAS taken off ships from around the world, now you can walk out of your apartment and take a waterside stroll at sunset. Trees, lights and chain railings have been added, but the original fixtures used to tie up the ships are still there. Here in front of us is the widest stretch of water in the former Docks, and we're looking towards the Lowry, centre right, and the adjacent footbridge. Salford Quays has a feel of somewhere far distant from Manchester - America, or the Middle East perhaps, but in 2000, the one thing missing is life - Even at weekends in good weather, the place seems deserted, and the water is mostly empty of boats. IT'S STILL POSSIBLE TO IMAGINE the Manchester Docks as they once were, if you look down the canal to this corner of Trafford Park, where renovation and repair work on ships is still carried out. 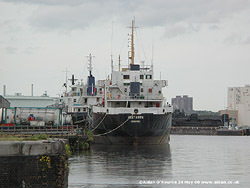 On the extreme right you can see Mode Wheel Locks, the first set of locks on the journey to Liverpool. I'm not sure what these ships are carrying - can anyone help? Though the "Port of Manchester" has all but ceased to exist, it's nice to know that you can see ships in the heart of a city 35 miles (50km) from the sea. THE INTERIOR OF THE LOWRY has caused much controversy - here we see the brash colour scheme that some people have complained about. But I like it, as it suits the bold, and frankly, rather crazy design of the Lowry centre. Sunny weather turned cloudy on the day of my visit - I'll be returning again in bright weather, when the centre is fully open to do more interior and exterior shots. Here are two more views taken just after the Lowry opened in late April 2000.